Our last Autumn Conference was held at Gatwick Airport. This one-day event was packed full of value to inform, educate and entertain members and guests from across the District and beyond. Next year, districts will only be required to hold one annual conference, the Spring one in May. As the Conference was held at Gatwick Airport it had a flight theme and by the end of it we were flying high. The keynote speech was brought by Aletta Rochat who flew in from South Africa to join us. 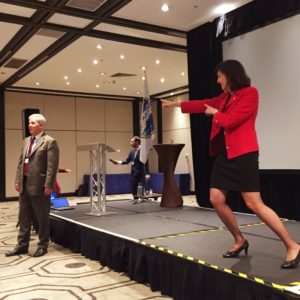 Aletta is the Region Advisor for Europe, the Middle East and Africa for Toastmasters International – and what an inspiring and affirming keynote it was! Aletta described and gave value to a range of essential service leadership qualities and then she invited District Director Pedro Casillas, to recognise members in the room who exemplified each one. There were also edifying Communications and Leadership workshops run by well-respected district leaders. 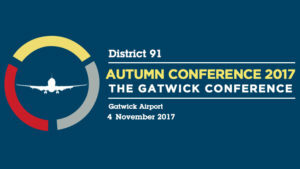 The District 91 one-day Conference will take place 08.30-17.30 on Saturday 4th November at the Hilton Gatwick, South Terminal Gatwick Airport RH6 0LL, and will be followed by an evening dinner. The theme is “Let your speaking fly”, where we will welcome our Key Note speaker, Aletta Rochat, a World Class Speaking coach, author of the “The Wedding Speaker’s Guide” and a public speaking trainer. The district Humorous Speech Contest and Table Topics Contest finals will also take place (see below), finishing with a Celebration Event.